Buddhism began in northeastern India and is based on the teachings of Siddhartha Gautama. Buddhism is divided into two major branches: Theravada, the Way of the Elders, andMahayana, the Great Vehicle. Buddhism is now prevalent in Sri Lanka and Southeast Asia, (where Theravada is popular) and in China, Japan, Taiwan, Tibet, Nepal, Mongolia, Korea, and Vietnam, and India (where Mahayana is more common).. There are about 300 million Buddhists in the world. The Theravada branch of Buddhism is called the “Doctrine of the Elders”. This branch uses the Tipitaka as its main spiritual guide and abides by the original teachings of Buddha.Theravada is also known as the “Lesser Vehicle” in Buddhism. For centuries, Theravada has been the main religion of Sri Lanka, Burma, and Thailand. Today, there are over 100 million Theravada Buddhists around the world. This branch teaches its followers to refrain from all kinds of evil, gather together all that is good, and to purify the mind. These goals can be achieved by developing an ethical mindset, meditation, and a deep thirst for knowledge. Followers of the Theravada branch describe themselves as imperfect beings that have a temporary stay on this earth. When an individual understands this nature of existence, they find nothing valuable in this world. Through this knowledge, there is no sense of greed in their lives. Then with this knowledge, a Theravada Buddhist can reach the state of perfection and enter nibbana. The Tipitaka, which is divided into three sections, is the fundamental scripture of Buddhism. Theravada Buddhists regard the Tipitaka as the complete teachings Buddha. MahayanaBuddhists also use the Tipitaka, but they regard the Mahayana sutras, or journals of theBuddha, as more important. Buddha’s disciples orally passed down the content of theTipitaka. The three section of the Tipitaka are the Vinaya Pitaka, Sutta Pitaka, and the Abhidhamma Pitaka. Rules and regulations for Buddhist monks and nuns are described in the Vinaya Pitaka. The actual experiences of Buddha are documented in the Sutta Pitaka. Along with the documentation of his experiences, there are extensive commentaries on myths and legends about Buddha. The doctrine of the absence of self and suffering is also found in this section of the Tipitaka. The Abhidhamma Pitaka contains works that teaches on theTheravada positions from Buddha’s teaching. 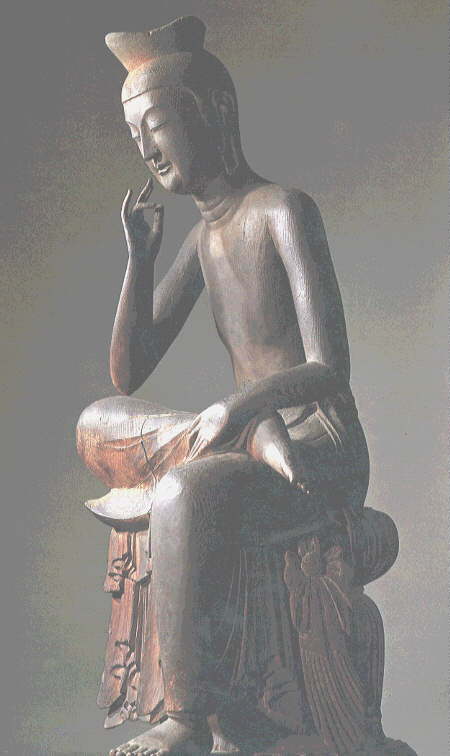 These works are now considered to be mainly for advanced students of Buddhism. According to Buddhist sources, the Tipitaka was written down after 50 BC. The word “tipitaka” means “three baskets”. The Tipitaka spread with the growth of Buddhism. Buddha married at an early age and lived the life of self-indulgence. However, he found that this life was dull and left his home in search of awakeness. On his journey, he met an old man, a sick man, and a corpse. From these encounters, he determined that suffering was a shared characteristic of all humankind. Then he came upon a calm and peaceful monk. From this encounter, he changed his outlook on life. This new life called for him to forsake his family, wealth, and power in order to be free to search for truth. This decision is known as the Great Renunciation. About 528 BC, while sitting under a tree, he experienced the Great Enlightenment. Through this revelation, he discovered the way to salvation from suffering. From this revelation, Buddha traveled through the valley of the Ganges River, teaching his doctrines, attracting followers, and establishing religious communities.